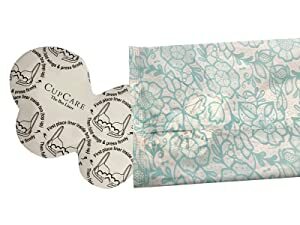 CupCare is a thin, soft, disposable non-woven liner that attaches to a bra and covers the wires for a perfect look. 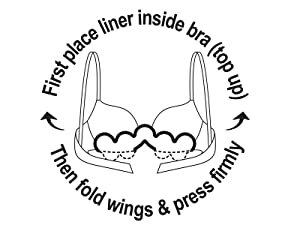 The skin-soft bra liner protect the skin below the breast, absorbs sweat, providing day long comfort and helps to have the bra from weae & tear of constant use and laundry (as bras are expensive, delicate and easily ruined). CupCare will make any bra more confortable by acting as abarrier bettween the skin and the bra. PROTECTS YOUR SKIN! ABORBS SWEAT FEELS COMFORTABLE SAVES YOUR BRA! Lightweight and porable, nearly invisible when on the bra. Save money – protect your precious bras. Individually sealed in polybag wrap for ease and convenience. Water absorption ability per piece: 15ml. Individually sealed in polybag wrap for ease The top layer remains dry. The middle layer absorbs Easy to use. Wraps the wires for a perfectly smooth look. and convenience. Perfect for women on the sweat. The bottom layer protects the bra. Soft wings fold over to hold liner firmly in place. Original Size: This size is perfect for cup sizes A-E abd cab aksi fut DD depending on the brand. On a wired bra or inside a dress. CupCare is a feminine consumer goods company providing innovative hygienic beauty solutions for women. The founder, Avigail Perl came up with the idea of placing a disposable liner inside a bra when experiencing discomfort and frustration from her own bras. After going through different phases of prototypes and several rounds of beta testing, a specialized manufacturing line is in place at a state of the art facility. CupCare believe in providing women with the highest quality products made from the best materials available. The CupCare bra liner went through vigorous testing and trials in order to bring our customers the perfect product. 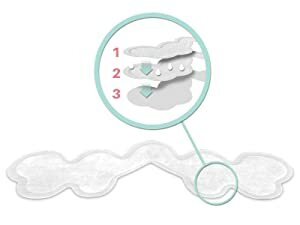 The CupCare bra liner comes in to fill the gap that is left by imperfect bras – it was conceived from women’s needs, invented, and designed by women – for women!